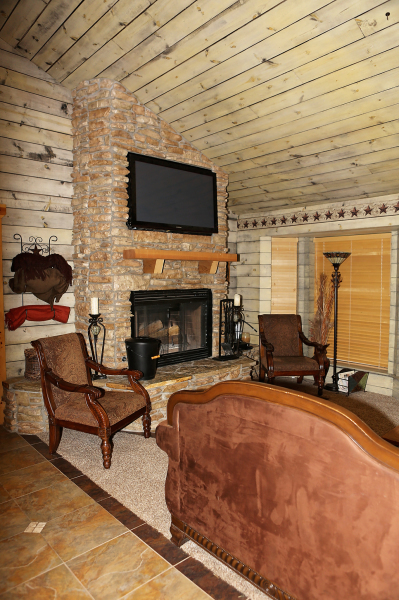 River Falls' main lodge was completed in August of 2009, and the three bedrooms three and a half baths lodge boasts many amenities. The Main Lodge features an extra-large kitchen with a center island for an added preparation area, two separate sinks with a disposal in each, gas range with six burners and one oven, double-stacked electric ovens, full size refrigerator and freezer, washer and dryer, and separate access to patio for servicing meals to patio. 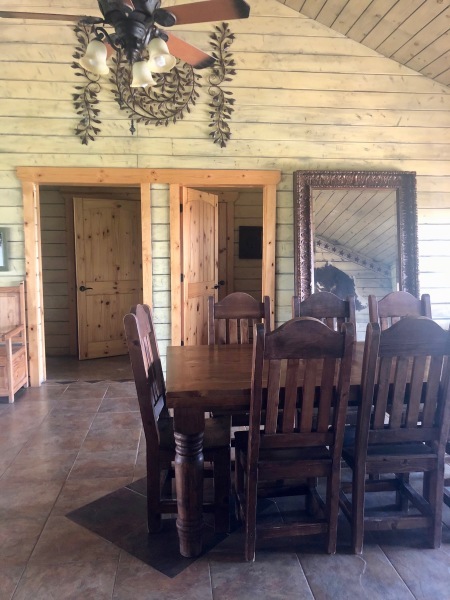 The living/dining area can accommodate plenty of family and friends with two sofas, comfortable chairs, wood burning fireplace, a dining table that can seat up to ten people, and a half bathroom. A granite bar is the center piece between the dining and living area. 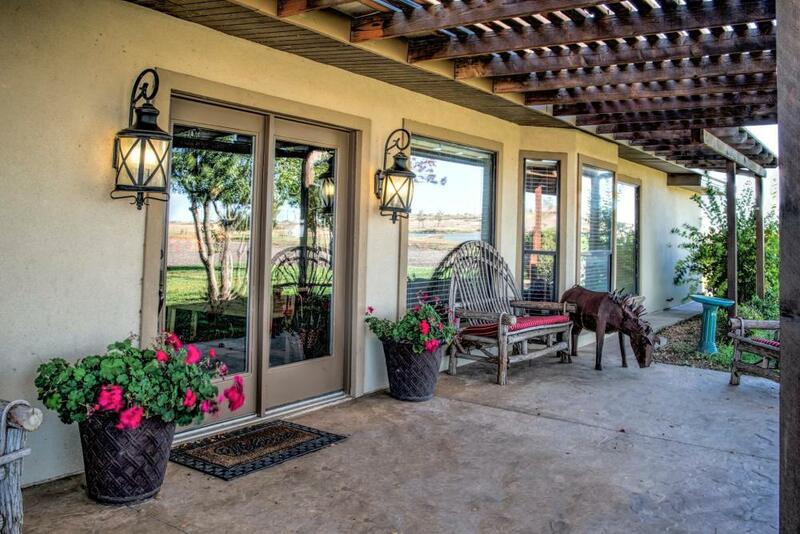 The patio overlooking the beautiful canyon below can accommodate up to ninety people seated. Two fireplaces in each corner create wonderful gathering areas. Lights adorn the wrought iron and cafe lights strung-out over the lawn. Deer, quail, ducks and geese, and an occasional fox or bobcat may be seen. The “honeymoon” suite is complete with a separate living area with refrigerator, microwave, coffee maker, flat screen T.V., beverage sink, queen size bed, a bathroom with a beautiful walk-in shower, and is perfect for a bridal party to prepare for the big event. 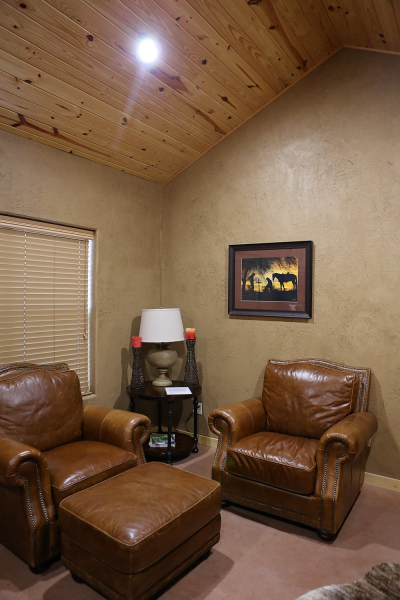 The bedroom has a spectacular view of the canyon and a private access to a fireplace on the covered patio. 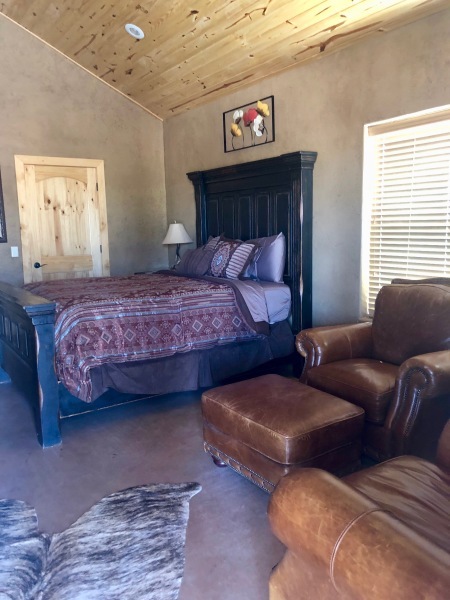 The second suite has a microwave, coffee maker, refrigerator, flat screen T.V., queen size bed, full bathroom with walk-in shower, beautiful view of canyon and a private access to another fireplace on the covered patio. 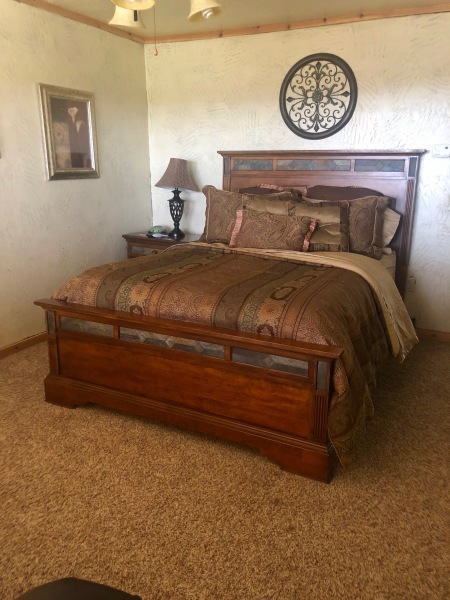 The third room is just a little more quaint and features flat screen TV, sitting area, full bathroom, queen size bed, and a beautiful view of the wonderfully landscaped front yard. 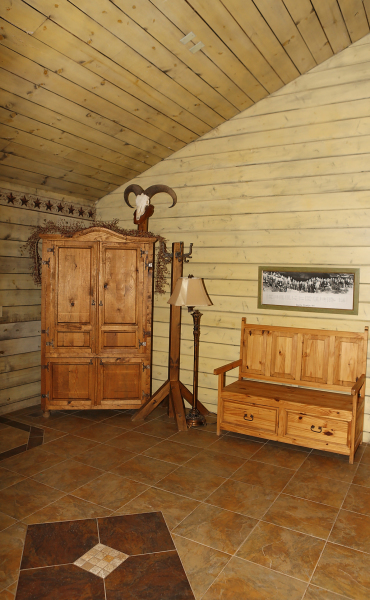 The Small Lodge features two large bedrooms with luscious linens on queen size beds, and beautiful furniture sculpted with Texas wood and fine leather. Each room has a spacious bathroom with double sinks and a giant walk-through shower. 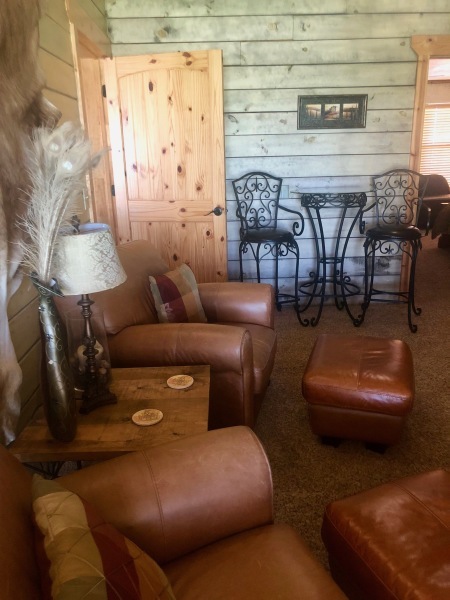 The spacious living area is anchored by a huge stone fireplace surrounded by a sitting area with a flat screen TV, beautiful Texas style leather furniture, and one of a kind stamped concrete floors. The full kitchen features all of the amenities you require at home and has a granite center island for gathering with your favorite meal and beverages. 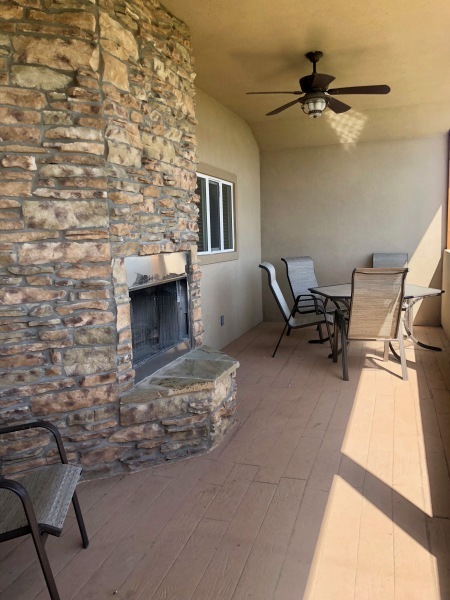 There is even a large patio that features another fireplace with a gorgeous view of the pond. In the evening, that is a favorite path for our local deer.